As anyone who lives here knows, Yeovil has more hills than Rome. 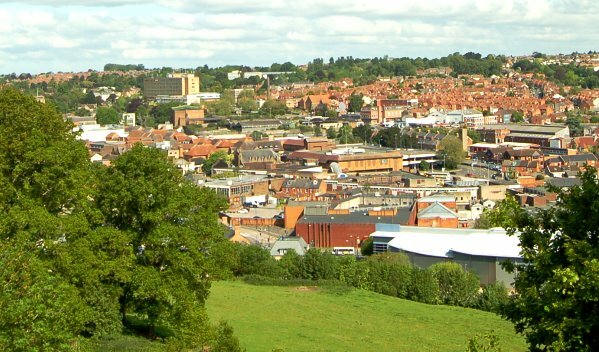 However the most spectacular is Summerhouse Hill on the immediate southern edge of the town - the summit stands at 353 feet (107.6m) making it the highest point in Yeovil. Passing its nine specimen oak trees on its steep flank, the walk to the top is well worth the effort and you are rewarded with spectacular views across the town and to the countryside beyond. On a clear day it is rumoured that you can see the Bristol Channel to the north (I haven’t yet, even with powerful binoculars). More easily visible are the north Dorset Downs to the south, the hills at Montacute to the east, the Exmoor Hills on the horizon to the northwest, the Mendip Hills to the north and the Corton Denham ridge to the northeast. Traces of Medieval farming practices still exist today on the lower slopes of Summerhouse Hill in the form of lynchets. On the summit is the Summer House, also known as the Round House, which was built by the Harbin family of Newton Surmaville, who owned the hill. It is rumoured that the Summerhouse was built so that they could send messages to the Phelp’s family’s tower on St Michael’s Hill at Montacute to the west. I’m not sure how true that is but the tower on St Michael’s Hill is clearly visible from Summerhouse Hill – check out the second photo in the panoramas above, the tower is visible on the horizon left of centre. 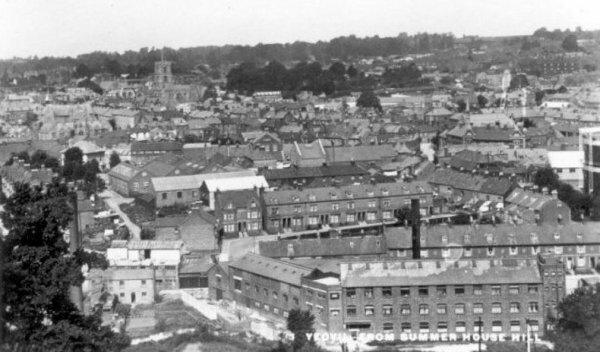 As the town of Yeovil grew dramatically in the nineteenth century, so supplying the town with water became a constant problem. Traditionally the town had relied on numerous wells throughout the town for its water supply, but as the town expanded and its population grew these proved inadequate and summer droughts became a regular feature. 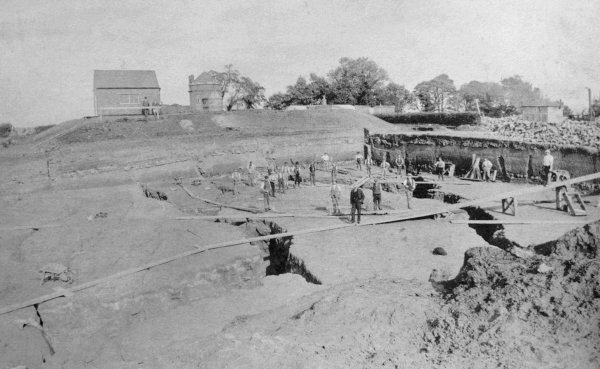 In 1897 a huge underground reservoir was constructed on the top of Summerhouse Hill (not that you’d know it was there today) with a capacity of one and a quarter million gallons. However this reservoir and another on Hendford Hill, of 800,000 gallons capacity, ultimately proved to be inadequate for the growing town. Both reservoirs were replaced in 1955 with the construction of Sutton Bingham reservoir, although the Summerhouse Hill reservoir was massively enlarged during the 1980s (see Gallery). Summerhouse Hill seen from Wyndham Hill. The Summerhouse is visible above the trees at extreme left. Photographed in 2013. 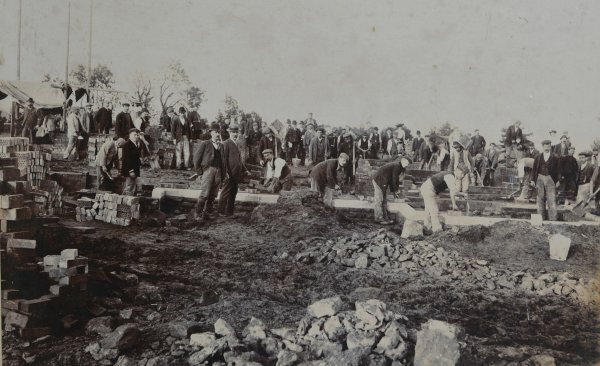 The reservoir being constructed on the top of the hill in 1897. Another view of the works - everything stops for the photographer! 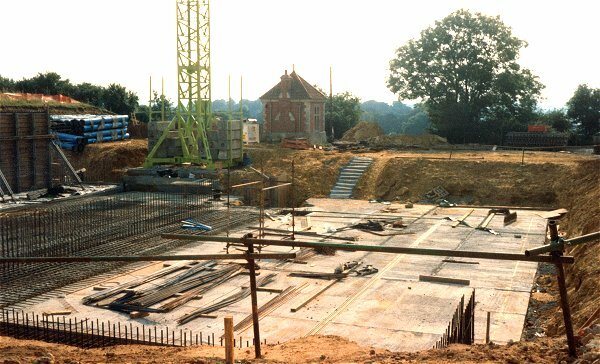 The Summerhouse Hill reservoir undergoing a massive redevelopment during the 1980s. Note the Summer House in the background. 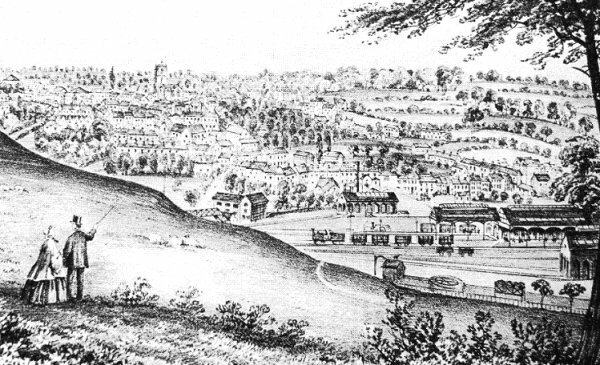 A drawing of about 1865 showing the view from Summerhouse Hill featuring the newly-built Yeovil Town railway station. "The town is surrounded on the South East by three remarkable hills - Babylon-hill, Windmill-hill, and Newton-hill. 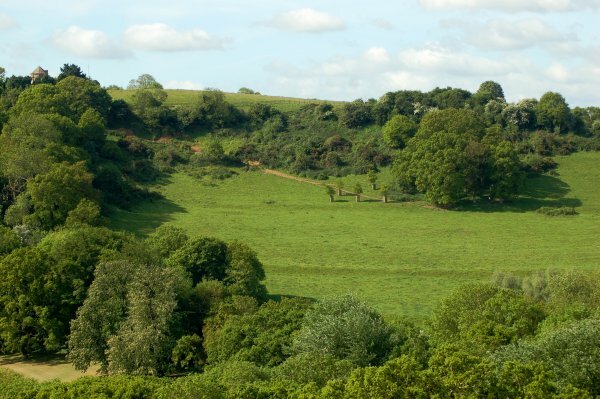 The landscape is also diversified by Newton Copse, the property of George Harbin, Esq., and the beautiful undulating plantations belonging to John Batten, Esq., flanked on the extreme south by some less extensive and elevated grounds, the property of F. Greenham, Esq. From these several points there are prospects so rich in fertility, verdure, and beauty, and smiling prosperity, - such a brightness, a greenness, and a repose, - that the spectator is wrapt in admiration of the view thus spread around and beneath him; and as the hum of distant voices from the busy little town in the valley below reaches his ear, and he looks upon St. John's gray tower, in its hoary age and silent grandeur, rising out of its midst, impressions something akin to adoration force themselves instinctively upon his mind." (Vickery, 1856). 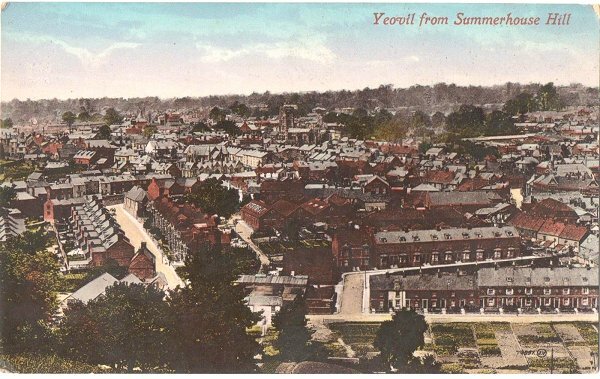 A postcard 'Yeovil from Summerhouse Hill' of around 1907 - note the allotments in front of Summerhouse Terrace at bottom right, Talbot Street behind it and Mill Lane at lower left. 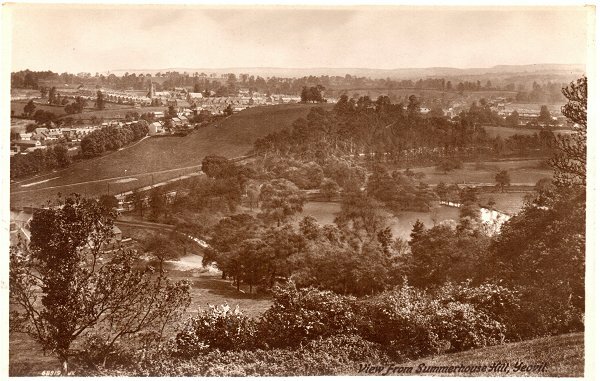 A postcard (the reference number 68919 dates it to 1911) of Wyndham Hill as seen from Summerhouse Hill. The scene is dominated by glove factories and rows of terraced housing in this photograph of 1940 . Almost the same view in 2013 (the top of St John's tower is just visible above the tree at extreme left). An aerial photograph of 1953 showing the Round House at top left of centre surmounting Summerhouse Hill. 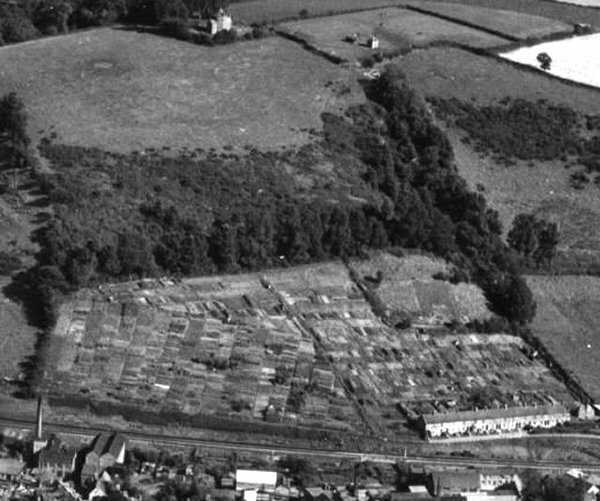 The patchwork of the lower slopes of the hill are allotments with the railway line running across the bottom of the photograph. At bottom right are Victoria Buildings. 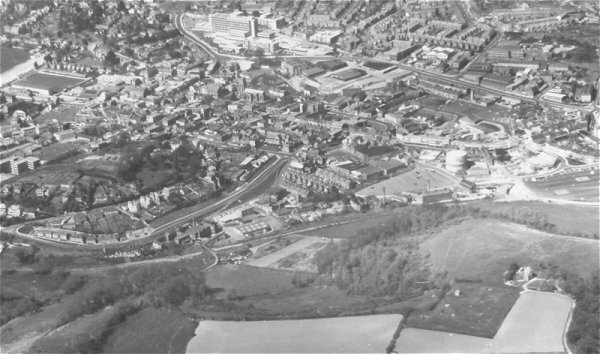 An aerial photograph of the 1960s with Summerhouse Hill and the Round House at bottom right. 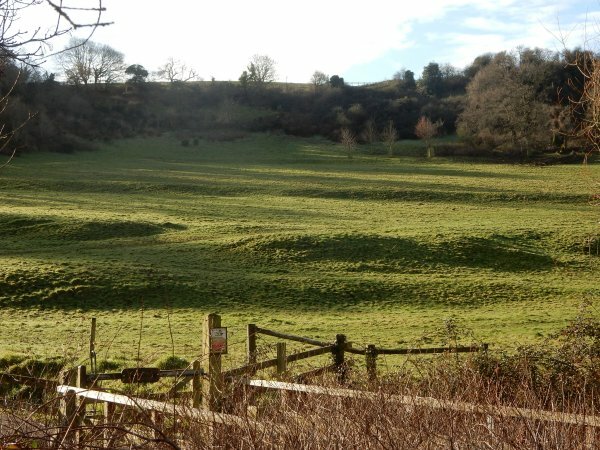 The legacy of Medieval farming practices - the remains of lynchets on the side of Summerhouse Hill. Photographed in 2016.